We’ve been using WP Engine for months now, had plenty of experience with customer support, account migration and have taken full advantage of all the features they offer. This review covers our full experience that we’ve documented since we started hosting our site at WP Engine three months prior to the initial writing of this review. There’s a lot we are going to cover in this review so that you’ll know exactly what you are getting into before ordering and activating your service. We discovered many pros but there are also several negatives that you should be aware of before deciding on the switch. Have a recent experience with WP Engine that you’d like to share with our readers? Scroll to the bottom of this review and submit it in. EXCLUSIVE DISCOUNT: Save 20% off WP Engine through Top Five Advisor. Use coupon code wpe20off to save 20% off your first month or annual plan. WP Engine improved our “Page Speed” and GTmetrix scores dramatically, improved our page load speeds and we’ve had nothing but great experiences with their customer support. For existing sites, migration can be a tedious process. WP Engine does not allow server emails from your WordPress blog, therefore, additional configuration is needed to enable email functionality. The cost of entry will be considered too high for many. No Free CDN, No 3rd party SSL, no multisite support, no phone support. Includes free CDN, 3rd party SSL support, enables dedicated IPs at $5/mo, and offers telephone support. Includes everything except a dedicated environment that the enterprise plan offers. What’s included in all plans is daily backups, caching, a staging area (we get into this later in this review), firewall, malware scanning, unlimited data transfer and WP Engine SSL if desired. Like we said, for most, the Personal Plan is likely the best fit and the cheapest option. As your site grows and gets more traffic, then you can consider an upgrade. Visitors Per Month? Explain That To Me! Unlike most hosts that simply limit the resources used by restricting bandwidth, WP Engine uses a different approach by counting the unique visitors a site receives. To them, a unique visitor is a different IP address. So, if you utilize a VPN service like VyprVPN and change your location 20 times and visit your site each time, you just added 20 to the visitor count shown in the dashboard. On the positive note, as an administrator of your website, you can browse your site, make changes, flip pages and even make your own daily archives and you will only change your visitor count by 1 the entire time. They offer unlimited bandwidth, so each visitor could theoretically use 1GB+ of traffic and you’d be fine as long as you don’t exceed the unique visitor count of your plan. Since we are still covering WP Engine in the pre-buyer phase, an important thing you should be aware of is the fact that WP Engine may not support your current plugins that you are using on your WordPress site. WP Engine Disallowed Plugin List. They do a really good job of explaining why they have banned certain plugins, however, you should definitely give that page a careful review before ordering. If you are using a plugin that is on that list, you will either need to remove it or change it to a better plugin that is approved. A big one that people love to use are caching plugins. First, you won’t need these because WP Engine does the caching for you. Second, you are considering switching to WP Engine so that you won’t have to worry about dealing with page speed load times, that’ll now be in the hands of WPEngine. This one caught us off guard completely. After doing our due-diligence and investigating several reviews, looking at their migration process and deciding to make the switch, we later discovered that they do not offer email delivery when your WordPress generates an email. This is a huge problem because you won’t see an email when you get a customer support request from your Contact Form 7 plugin, you won’t know when someone has submitted a comment to your post(s) and you won’t see when your WP install generates a notification like when it has upgraded your WordPress to the latest install. The Workaround – Here’s what we did to enable emails from our WordPress install here at Top Five Advisor. Easy WP SMTP – A free plugin that allows you to specify SMTP settings from a different email provider. We went through 5 plugins before landing on this plugin that worked 100% each time we tried (in localhost, on WP Engine and on another website we operate). Google Apps for Business – For only $5 per month for one user, you can setup Google Apps for your domain name and use the familiar gmail service to get and send emails. 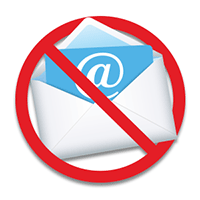 Since we prefer to use Mailwasher and POP3, we just enabled POP3 in our Google Apps Email settings. Note: If you want to have multiple email addresses, you can setup what Google Apps calls “Email aliases” that allow multiple email addresses to all arrive to the same user mailbox. Don’t make the mistake we did and setup separate user accounts because it will add additional fees to your monthly rate after your 30 day trial. WP Engine Migration – Piece of Cake! Starting a new website? You can skip this section if you are starting a new WordPress website because there’s nothing to migrate. Lucky you! Ok, admittedly, the migration checklist looks overwhelming and you’ll probably have the same reaction I did when I saw this massive checklist. After going through the process though, we found it to be intuitive and very friendly. It hand-holds you through the entire process of site migration and allows you to check things off as you go. Once we realized this migration was made for both new users and veterans alike, we realized their method made a ton of sense and very beneficial for the non-techie type that just wants to get their site on the worlds best WordPress hosting and be done with it. Here’s the time you should expect to spend in the migration process. Ignore all of this if you are starting your site with WP Engine. Setup < 5 Minutes. All you do is enter your primary domain name here and get your SFTP information from your email. You can use the free FTP software FileZilla to FTP in to your new account. Update < 30 Minutes. Here, they ask you to 1) make a backup with your current host with a link explaining how. They also ask you to 2) review the disallowed plugins we talked about earlier and lastly, they want you to 3) login to your WP Admin of your current site and make sure all plugins and WordPress Core are updated to the latest version. 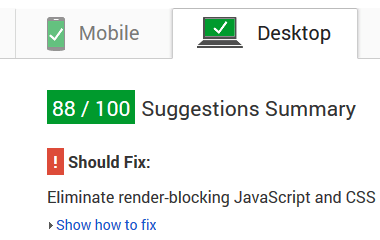 Recommended Additional Step: After you update the plugin and core, go back to your website and make sure everything is still working as expected. If it is, go ahead and download an additional backup of your site that has everything updated. Export – 30 Minutes to 3 Hours (depends on your site’s size). This is where is can get complicated for non-technical users. You’ll need to know how to use PHPMyAdmin in your current host’s control panel (likely cPanel) and export your entire database. They give you a clear step-by-step guide to accomplish this but the unfamiliar screens for some users might be a tad off-putting. Once your database is downloaded, you’ll then need to download your entire wp-content folder from your WordPress website. We don’t like their instructions here, at all, because they are telling you to use FileZilla and download individual files. Scott Buehler, the writer of this review, has created a separate post and video screencast explaining how to use cPanel to download your wp-content has a zip file for WP Engine migration. Import – 2 Hours+ (depends on upload speed and size). Now you are going to use PHPMyAdmin on WP Engine’s side and upload your SQL file. They give you clear step-by-step instructions that work 100% of the time when followed to a “T.” After that, you upload your wp-content.zip folder to WP Engine via SFTP and then click a blue “Notify Support” button. They will then go in and extract your zip file to your server. Verify < 1 Hour – Go ahead and preview your site on WPEngine’s server, make sure everything is working. It won’t work 100% correctly because your database is pointing to your domain name that has hosting elsewhere, however, you should be able to see your content, comments, structure, etc. Launch – 1 Hour++ – Login to your domain name registrar and configure your DNS settings as they explain. They offer a GoDaddy and NameCheap walkthrough to help as well. One hangup we had here is they don’t tell you that you need to set the nameservers back to default (where your domain is hosted at your registrar and not your current web host) and THEN change your DNS settings. I had to go to support to resolve this issue I had. Use the “Notify me when my site is live” option to get an email when WPEngine detects that your site is serving pages from their servers. The bottom line is you can expect to spend at least 6 hours to complete the entire process. That includes file downloading and uploading, waiting for DNS propagation and the rest of the process. Scott Buehler Will Help You for FREE! 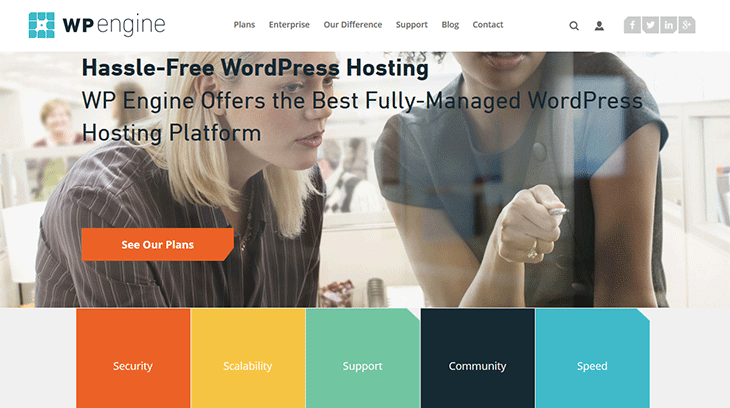 Order your WPEngine through this link and Scott will help you with the process as needed. The hardest part of the process is downloading the files and transferring them over to WP Engine’s side. That’s all extremely easy for him and he will gladly help for sites less than 1GB in size for no additional cost. After ordering, contact him directly for assistance. Once you are transferred, the magic begins. You’ll have access to some really awesome features that aren’t available anywhere else that will help you either immediately or down the road. One of our biggest struggles with WordPress has been caching and Google Page Speed scores when using WordPress as our content management system. When you load 20+ plugins and start taking full advantage of what WP has to offer, you’ll likely notice your site will start to load slow and if you use Google Page Speed, you’ll see “D’s” and “F’s” for your score. Delays in your page loading times can cause people to leave your website before they even see a word because we live in an ever-impatient world these days. After we switched to WPEngine, enabled the CDN features and took full advantage of everything that they have to offer, we saw one of the highest score’s we’ve ever seen on WordPress. Keep in mind we didn’t have a caching plugin installed on our site because we intended to move over to WP Engine which banned W3 Total Cache, the plugin we normally use. The bottom line though, if you don’t use caching plugins and you don’t use a WordPress hosting service like WP Engine, you are doing a serious disservice to your visitors. This is where the magic begins. Most hosts offer a nightly backup, but they are off-site and not accessible to you directly. 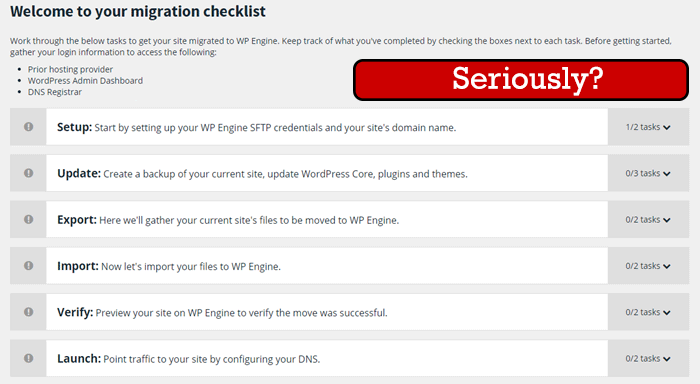 With WP Engine, they automatically backup your site on a daily basis and call them “daily checkpoint” backup points. Not only that, but you can create your own backups when you are updating your content or when you make a major change. If you screw up your entire site, it is just a matter of logging in to WP Engine, clicking the mouse a few times and then your site is restored within minutes! If you got hacked, if a plugin turned rogue, if a removal of a plugin made your site crash, if your database gets corrupted, just head over to your WP Engien dashboard, click backup points and start restoring. It’s never been this easy. We got lucky in writing this review when we did because there has been a major security exploit in WordPress that was recently patched. While most people are careless with their WordPress security, WP Engine has you covered, even letting you know that a recent exploit isn’t affecting their users. Their blog also covers a wide range of security topics and, after reading, you will likely come away from there with more confidence in your decision to go with WP Engine. We highly recommend taking a look at their blog occasionally to stay up to date. Regardless, your site will be kept up to date with WP Engine and they will even automatically ensure your site remains up to date and protected. WP Engine Staging – A Revolutionary Concept! When your site first goes live and you login to your WP Dashboard, you will notice a new option that is suddenly available at the upper left adequately called “WP Engine” that has additional options available. The first tab offers you the ability to enable “Object/Transient Cache” which you should do (improves speed). You can also verify if you are currently using a CDN and also have the option to turn off this menu or restrict to to certain users. The second tab is pure magic. It’s called “Staging.” We recently used this feature to debug a problem we were having with our current theme and we discovered that we no longer need to use our localhost to test changes! Scenario: You report to your theme company that you are having a problem with XYZ feature and you think it is a bug. 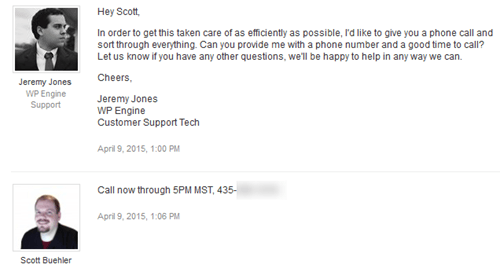 Their Likely Reply: You likely have a plugin conflict. May we disable all your plugins to see if that’s the cause? “Heck no!” you say… at least we did. We’ve got a ton of content on this site that relies on the plugins being enabled, we can’t just disable them, that’d be a nightmare. 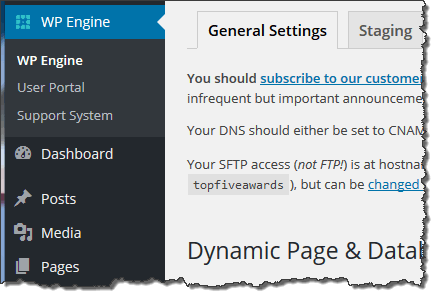 With WP Engine, all you need to do is click the blue button “Copy site from LIVE to STAGING.” It will copy your site to a new staging URL called something like yournormalsitename.staging.wpengine.com. It will automatically configure your database and URLs on the entire site to work with the new URL and you can login to your /wp-admin as you normally would. From there, you can fully troubleshoot, add new plugins, attempt to explode your site, delete plugins, change themes, test functions, run special code, etc. All the changes you make will remain in the staging area and won’t hurt your live site at all. Now you won’t have to “hope” that the changes you are making will work. Instead, you’ll be a smart webmaster and use STAGING to make tests, add plugins and ensure compatibility beforehand. If they work in the staging environment, you can either “Copy site from STAGING to LIVE” or you can simply go back to your live site and make the same changes with 100% confidence that it will work as expected. Be Careful: Make sure you watch your browser URL to make sure you are visiting the staging WP Engine URL before making changes! The last thing you want to do is destroy your live site (although a daily backup restore is available, you may lose some comments depending on your site’s activity). Another added touch that WP Engine thought of is that they will automatically block robots to index your staging area. 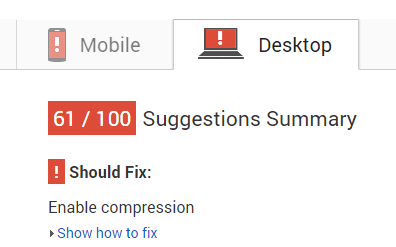 This becomes apparent if you use the WordPress SEO plugin by Yoast which will alert you that there’s a “HUGE PROBLEM” which, in this case, is an excellent thing. You don’t want Google to think your staging area is a real site. Going one step further, you can go to your WP Engine dashboard and click Utilities. From there, you can password protect the staging area to double-ensure that Google and other search engines will not discover and index the area. We hope this extended review was valuable to your research. If there’s anything you’d like to see reported in this review, please comment below. Consider purchasing your WP Engine through Top Five Advisor and you’ll save 20% off your first month or 20% off their annual plan which also includes 2 free months of service! Win/Win/Win! Click here to order. Finally, let’s talk about our experience with their customer support. When you access their “Support Garage” area from your WP Engine Dashboard, you will see 23 categories on the left with topics ranging from account management to theme issues. You’ll also see interactive walkthroughs which is a really nice touch (we recommend watching a few). When you watch an interactive walk-through, it will show them clicking areas of their dashboard, using features and more. It takes video to a whole new level by hand holding you through your entire problem, from start to finish. You’ll have access to hundreds of articles via their search function which is one of our favorite features to get the answers we need quickly. What About Actual Human Support? As you can see from our screenshot, you’ll be able to use live chat, call them (on Professional plans or higher) or open a ticket in their ticket system. Live Chat – We found our wait times over the last few months to range from 3 to 10 minutes. One advantage of this support avenue is you’ll get access to real support agents who can help you on the spot.Real Example: We launched our site on WP Engine and then decided to go back to the drawing board in localhost and use a different theme, different plugins and overhaul the site structure (switched from multisite to regular). We had to re-migrate to WP Engine from localhost and had to have them delete the wp-content folder, extract a new zip file and their support agent did it right there on the spot, within 10 minutes so that our site wouldn’t be down for too long. Call Us – We don’t prefer calling, however, there was a complex issue we were having with redirect rules and their support representative actually asked us if he could call us to get it sorted out. In the 12+ years of being Internet marketers, we’ve never seen something like this happen from our hosts! Open a Ticket – Response times are really good. There was only once where I was disappointed with the response times when I was re-migrating (see real example above), request #371796. I waited 3 hours for a ticket I put URGENT in the subject line requesting they delete my wp-content folder. It was then I realized that time-sensitive requests should be made to live chat, where Zach P. fixed me up within 10 minutes (including live chat waiting time).